The final recipe in this week's mint quadrilogy. 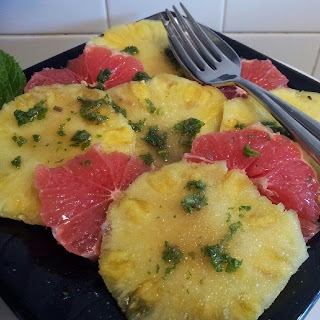 I was feeling really virtuous when I came home from work and tucked into a plate of soft, sweet pineapple and cheek tingling red grapefruit (I didn't pay attention to which colour grapefruit I picked up at the shops so don't shoot me) and summery mint sugar. And then the husband persuaded me to have a chippy tea so now I'm feeling fat and bloated and a bit greasy. For every yin, there is a yang and all that. Not much to say tonight, mostly because I have to do a whole load of washing, ironing, packing, recipe printing and more cooking related packing. And work. Hence the really quick and easy recipe and lack of soul searching post. Never would've thought about doing anything with these fruit other than eating them by themselves. I added a squeeze of lime to the mix for a really tropical taste. Will definitely be eating this a lot post holiday!